Our private air conditioned SUV will arrive at your hotel 15 minutes prior to the departure time to pick you and your group up. After a 40 minute drive to the Red Rock Canyon Conservation Area we will begin our adventure with a 2.5 mile hike through the Calico Tanks. The hike starts out flat and progresses to a moderate level with a small amount of scrambling up rocks and a few areas with rock stairs. 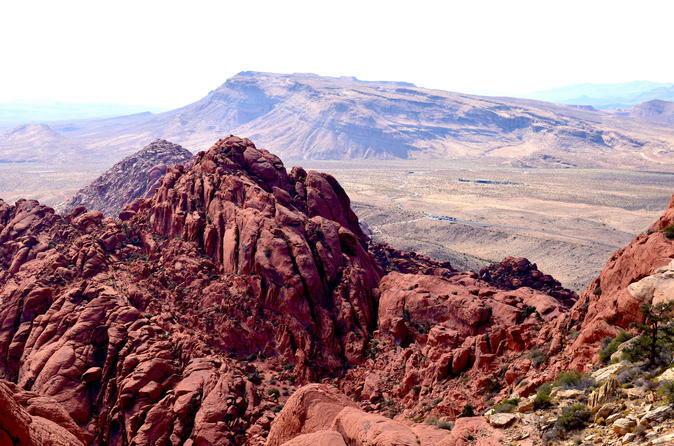 This scurry over jumbled sandstone leads to a hidden water pocket (seasonal) and a great view of Las Vegas. There will be many opportunities for amazing photos. Your guide will be taking candid and posed photos during your hike and will be edited and shared with you after the adventure, free of charge! Water and Sunscreen will also be provided. Please remember to bring appropriate footwear and clothing to hike a desert mountain. After the Calico Tanks hike we will return to the car and drive 10 minutes to the trailhead for Ice Box Canyon. We will have lunch here before taking off on the trail. The trail takes you through a cool, shady box canyon with seasonal waterfalls (December-April) in the heart of Red Rock Canyon National Conservation Area. The narrow canyon rarely sees sunlight, and the cool water and air pouring down from the mountains keep it significantly cooler than the open desert. The hike is 2.5 miles each way and has many areas where you will scramble over large boulders.